When I was testing the VR headsets I downloaded different apps from the Apple App Store. This app was great, the scene is set it a Jurassic forest, where you can see all of the tropical trees and life that was around millions of years before us. For this app you just have to turn your head in the direction you want to walk and you start your adventure through the forest. I didn’t encounter any problems with this app, and would recommend to anyone who’s interested in dinosaurs! Final Kick VR is a football game that allows you to take free kicks and penalties against a simulated computer goalkeeper. To play this game you don’t even need a controller you just have to look in the direction you want to shoot and power your shot up. This app was relatively easy for me to use and was one of my favourites. This app allows you to feel what it is like to be sat on a roller coaster. You go upside down, the app has a really good real life feel to it and can make you hold onto your chair at times. 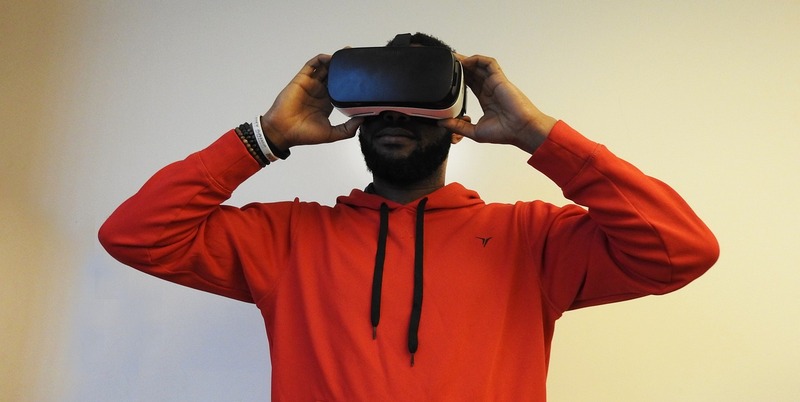 This is an app which allows you access various different VR experiences such as going to concerts and also swimming in the ocean, the app takes you on a little story depending on which experience you have clicked on. I really enjoyed using this app. My overall conclusion on virtual reality is that you must try it out. After playing around with all of the different gadgets I would recommend buying the VR Shinecon. My reasons for this is because at £20 it is a very good price, and the product feels like it should be more expensive than in is because of the appearance. With this gadget you don’t have to hold it to your face either you have a comfortable head strap which fits over your head. This is a perfect gift for Christmas! This blog was written by our work experience student Oly in November 2016. He also wrote a piece on what VR headset you could buy which you can read here.